PVC occupies a unique position amongst the comity of all materials of construction. It is the only polymer where the basic organic building block can be extended more than 3 times while converting into value added end products - the remaining material being predominantly low cost materials inorganic in nature. It is the only polymer which transgresses the boundaries of extreme elasticity to extreme rigidity with a unique range of flexural modulus values (3 MPa - 3000 MPa) - thereby yielding a versatile range of products from soft rubber like to very hard metal like applications. It is the only polymer where 60-70% primary applications go into very long life (more than 25 years) products thereby minimizing the waste load on our fragile eco-system It is one of the few synthetic materials which, while supplementing and complementing scarce natural resources, have emerged as materials of construction meeting unique techno-economic requirements of modern society. PVC is the predominant material that supports infrastructural requirements across the globe thereby meeting the developmental needs in this crucial sector; it would be impossible to conceive modern activities in Building & Construction, Water Supply, Power Distribution and Telecommunication without the use of PVC. PVC has also played a very crucial role in meeting socio-economic needs particularly in developing economies. The low cost yet aesthetic end products from this polymer have almost turned around the social lifestyles and societal demands and in meeting the aspirations of the poorer sections of economy. No other material can match PVC in its versatile processing techniques. The polymer can be calendered, extruded into rigid and flexible profiles, injection moulded, compression moulded, blow moulded, rotomoulded and slush moulded. It can be coated by various techniques like spread coating, spray coating, dip coating, fluid bed coating and it can also be cast. This inherent flexibility in processing techniques not only yields an amazing variety of products but also provides impetus in meeting entrepreneurial aspirations at various levels of skills and investments. PVC is the world's most thoroughly researched thermoplastic particularly in terms of Health, Safety and Environment (HSE) aspects and Life Cycle Analysis (LCA). Finally, inspite of various sensitive environmental issues and the adversial role of Green Peace movements, PVC due to technological developments has not only survived but is indeed slated to be the eco-friendly star of the decade. Defying the predictions of several pundits on maturation of these products in the life cycle we can definitely look forward to strong growth in demand of PVC not only in traditional sectors but also in emerging new sectors and applications on the global horizon. PVC production started in India in the year 1961 when Calico Industries put up a plant based on Calcium Carbide route. In 1967 the first alcohol based plant was commissioned by Chemplast. The Company also pioneered the production of paste (emulsion) grade in the country. The first integrated PVC complex based on naphtha cracker was established in 1968 by NOCIL. In 1991 Reliance Industries Limited brought about a sea change in local production with a world scale plant (160 KT enhanced to 300 KT) based on imported feedstock. Today we have an installed capacity of 750 KT against a demand of 650 KT. Market share of PVC among the thermoplastics in India is 23% growing at an annual growth rate of 6-7%. The major consumption sectors are Irrigation/water supply (38%), Buildings and Construction (23%), the remaining being used in medical, footwear, profiles, packaging etc. In recent years, PVC - Vinyls have come under intense scrutiny on environmental grounds particularly the apprehensions regarding emission of Chlorine products and dioxins, and adverse aspects of Phthatates. This note provides authentic information disproving the widespread misgivings . PVC has been under severe attack for almost 20-25 years when it was discovered in mid 70s that VCM monomer induces angiosarcoma, a liver cancer. Initially the problem was restricted to occupational exposure during manufacture. However concerns were expressed for risk to human beings. The PVC industry rose to the environmental challenge in a short time; first to reduce exposure of VCM during manufacture and then to contain it. The closed reactor technology coupled with clean reactor systems brought dramatic reduction in VCM exposure. Further the treatment of VCM by solvent absorption activated charcoal eliminated the emission to atmosphere. The occluded residual VCM in PVC particles was brought down from a level as high as 1000 ppm to the level of 1 ppm by slurry stripping techniques. 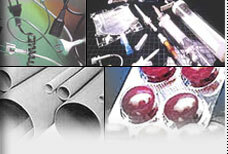 PVC industry has passed the critical acid test. Today most of the PVC produced in the world contains very insignificant levels of residual VCM. Not surprisingly the Food and Drug regulatory bodies across the world do not consider the extremely low levels of VCM in food packaging a human health or environmental risk. It is even considered to be safe in its use in medical field. Perhaps the biggest contemporary threat to PVC is the issue of its disposal particularly from municipal solid waste (MSW). The major volumes of PVC are used in products like Pipes, Profiles and Cables which have a long life-almost extending upto 50-100 years. PVC in packaging and disposable application (short life products) does not exceed 10-15% of the total consumption. Latest figures for 2000-01 show that "short life" PVC Products form only 8% of total PVC produced. Details are worked out in the following table. It is therefore not surprising to observe that PVC component in municipal waste is lowest (less than 0.5% by weight). PVC on account of its high chlorine content is considered by the environmentalist to be obnoxious. However the fact remains that its presence at such low levels in municipal waste streams could not cause any significant problems. It is argued that PVC (because of its chlorine) when burnt can form HCI and an organic chloride product called Dioxin (2, 3, 7, 8 - tetrachlorodibenzo-o-dioxin). * Figures in Bold indicate short term usage items, totaling up to 54000 tonnes per year.